In this preset package you'll find five of my personal custom presets for Adobe Lightroom meant to enhance your images & help you get one step closer to finding a style you love! TB1 & TB2 are designed for portraits with focus on even, natural skin tones without sacrificing the color & mood of the scenery. TB3 & TB4 are designed for Landscape photos with focus on enhancing natural earth tones & pleasing color palettes. The TB5 preset is black & white for those portraits or landscapes where the light & contrast are just right to convey what you want without the distraction of color. Also included in the package is a Tutorial & Tips document to help you get the most out of your presets. 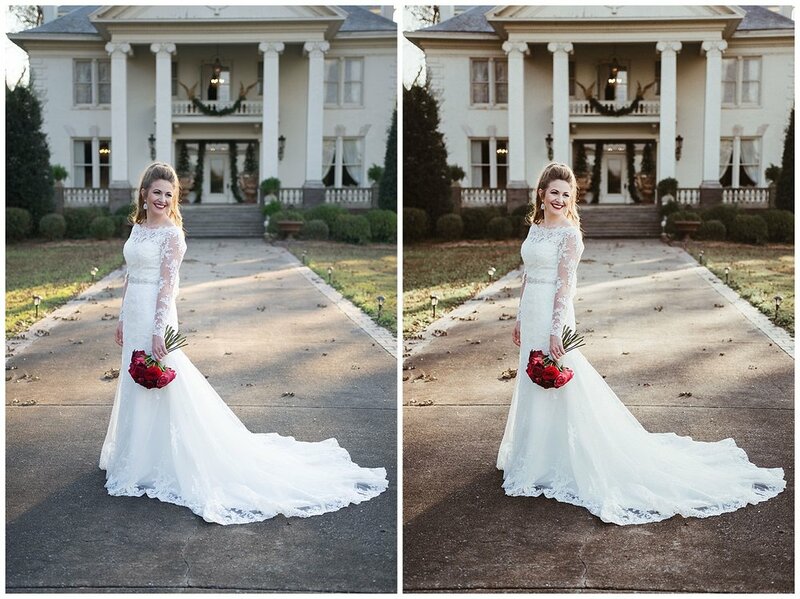 These are the presets I personally used on the vast majority of my work through 2017-2018 including features in Arkansas Bride & Arkansas Life Magazines! That said, I am presently developing new presets for myself & possibly for purchase here soon. Use #TBPhotoPresets so I can find your photos & feature them on my story! Editing is a crucial part of the creative process in digital photography. It can take your images from heaps of raw data to works of art, & set you apart from the others by giving the right "look" to your unique style of shooting. I take a lot of pride in my editing process & have spent two years now creating custom Lightroom presets that can be applied & tweaked to fit most scenes, colors, moods & situations. As a teacher in "real life," I hope to use my servant's heart in the photography community to help others carve out a style of their own by sharing, learning, & teaching. Keep reading for more information, sample before/afters, & pricing! This portrait preset is what I use most for weddings & engagements sessions. The focus is on even skin tones without sacrificing color. It is "on trend" without being desaturated or overly warm. Greens are brought down to help other colors pop among the scenery, while the warmer colors are balanced for most skin tones. Truer colors bring out truer emotions! The second portrait preset is what I use for more intimate sessions. The rich tones in this preset work best with photos that can give you all the feels. Skin tones are warm & balanced while the whites are clipped for a creamier look that I love for indoor sessions with a lot of white space. Moody, but not too moody. More like a warm & fuzzy good mood. This is my primary preset for Landscapes! I typically alter my landscape presets seasonally, but I've tested this one on all four seasons worth of photos in the Ozark Mountains & have loved every outcome. It works outside the Ozarks as well, just check my 2017 Yearbook page for examples. This preset matches best with the tones of TB1, but the warmer colors are brought back to life for better sunset photos while blues are drawn more toward the turquoise colors of the streams around the Buffalo National River. This is my newest preset I developed after shooting on vacation in California with a lot of unpredictable lighting & all kinds of new colors! Everything from sunrise on the Point Reyes coast, fog through Yosemite, and sunset at Lake Tahoe works with this preset. The tones are creamier, much like TB2, & that tends to help bring back some detail and texture into with bright skies that may be a bit more washed out. Colors lean warmer, but are faded a bit. Great for moody scenes! Think foggy forests & twilight wanderings. This is my black & white go-to! I love including knock-out B+W photos in client galleries, & this preset does the job. Landscapes with the right light & contrast work beautifully with this preset as well. Perfect for making subjects pop in contrast with a scene. Even if your photo isn't too contrasty, this preset will add a good bit for you! The only tweak difference I use between a landscape or portrait with this preset is the shadows slider.